Undeniably, in the last five years as new musicians have entered the arena, there has been a rise in record labels and the concept of 'band' music has slowly disintegrated and made way for a much broader spectrum of music genres rock, pop, heavy metal, hip hop, R&B, electronic, fusion folk and many more. The blast of new songs did not manage to erase the old classics from our memories though-they were decorated with modern music, which appealed to the young generation, though not always to good effect. Songs like 'Krishno' rearranged by Habib broke all barriers of age and class and shot him to fame overnight, even among the Bangladeshi diaspora. Companies grabbed this opportunity and produced jingles, which like Nescafe's 'Cholo Shobai' became hits in their own right. The telecom industry is perhaps making the most of the rise in Bangla music from ring tones, caller back tones and TV commercials, there is no end to the promotion of music. Fuad Al Muqtadir, a relatively new entrant into the music industry, who does all his work from his studio in the US, has already managed to make waves with his unique style of electronic music. His latest hit 'Shona Bondhu' from the album Variation No. 25.2 is a hot favourite of joy riders but has also received criticism for its crude lyrics. “I don't care what's socially decent or indecent or what is musical,” says Fuad, “I do a lot of things in the name of good humour. I try to keep it real and not hide behind a facade of cultural decency.” Fuad says that he likes taking risks and portraying what really happens in the world. Singer Sahana Bajpaie whose rearrangement of Tagore songs is set to come out this month does not think that remaking changes the original 'feel' of the music. “On the other hand,” says Sahana, “It actually caters to a lot more people than the originals do.” Musician Maqsudul Haque raised a huge amount of controversy when he rearranged a Tagore song five years ago. 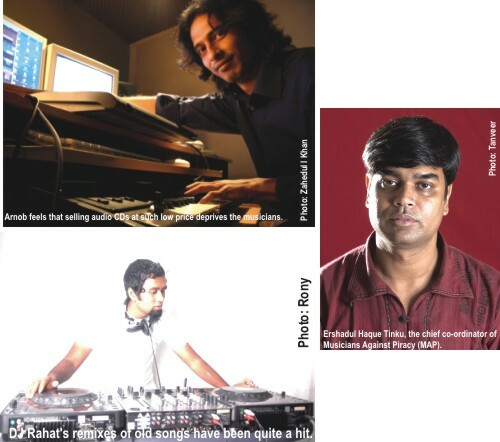 DJ Rahat, whose DJ remixes of timeless songs like 'Ashar Srabon' and 'Dakatia Banshi' have replaced western and Hindi numbers on the dance floors of Dhaka, believes that changing the music of such songs appeals to the young generation. “I try to maintain the original 'feel' of the song while changing the music,” says Rahat. There is a lot of criticism about the hip-hop culture with its use of slang and crude language. To this Kazi says, “Everyone, no matter what age-group they fall under, have used, still use and probably will use slang in their daily lives. It (the slang) is very well embedded in every culture around the world. Therefore, I don't see how using slang is an example of 'anti-culture' when it comes to our own culture. Its just gestures we use with one another to show how we feel. Of course, we didn't want to go all out and use slang to the point it becomes plain vulgar, moreover it's a watered-down version so the listener can get the idea without having us spell it out for them.” Kazi believes that today's generation is very open-minded and are slowly coming out of the 'fixed-box-mindset' mentality. Apu believes that more people are listening to Bangla music these days. “Our musicians are doing so many new things. Listeners are getting interested in Bangla music because its quality has improved a lot and radio is just a way to link the artistes and the listeners,” he adds. 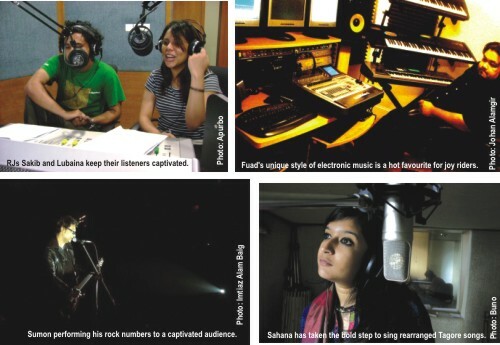 With the rise in Bangla music, the number of record labels has also gone up. 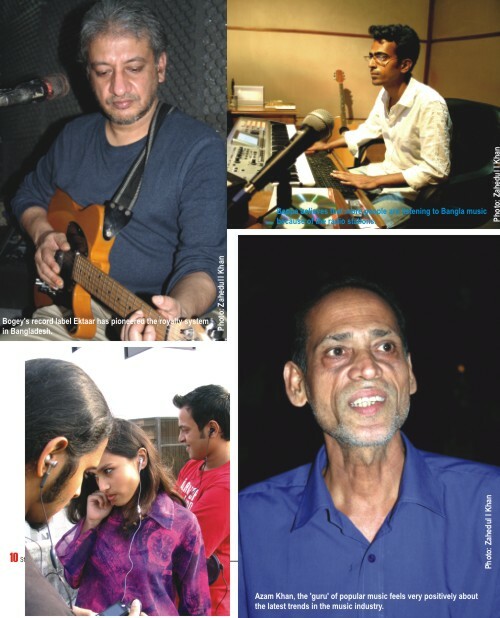 Ektaar music is the proud label of such alternative bands as Bangla and Habib's super hit album 'Krishno'. According to Feisal Siddiqi Bogey, its founder, when Ektaar started there was an underlying thought there was no money to be made from good quality music or the audience was not music-literate enough. “It has been a prevalent thought among many musicians that as far as music is concerned the audience is not in the same level as us,” says Bogey, “We do not subscribe to this point of view. We've always said that the problem with the Bangladeshi music industry is that people are switching off because we are not giving them anything worth listening to. But the lyrics of Nazrul Islam and Rabindranath are still very popular. So in fact, quality has always sold better in Bangladesh.” And indeed good quality songs from Potheek Nobi and Bangla's 'Kingkortobbobimur' have sold like hot cakes, in fact 'Kingkortobbobimur' and Habib's 'Krishno' are still a couple of the best-selling albums in Dhaka and among the Bangladeshi disapora years after their release. Ektaar is also a pioneer in giving royalties to artistes, which is a norm in all record labels in countries around the world. Royalty ensure that the artiste or band gets his/her rightful share of the revenue earned as it is difficult to predict how well an album will be received by listeners before it is released. He points out that CDs are sold too cheaply to the customers. “It's not fair to the musicians,” says Arnob, “In a country like India, CDs are not sold below Rs 125 while in our country CDs are sold at Tk 80, 60 and even 50.” Talking about the breakdown of producing a CD Arnob says, “It takes about Tk 30 to produce a CD and Tk 25 if the cover is made of paper. Record labels sell these CDs to the shops at Tk 30. That leaves basically nothing for the artistes.” Arnob says that if the CDs are sold at Tk 100 to the customers, everyone will get a fair share. Azam Khan is very pleased with the changes in the music industry ever since he started the revolution in the 1970s. “At one point there was a sudden fall in the music industry but I think it's back on its feet and doing quite well,” he says. Thanks to the originators of 'band' music and the consistent hard work of the musicians, Bangla songs are once again on everyone's iPods and MP3 players. And with the help of TV Channels and radio stations, along with the enthusiasm of the telecom industry, hopefully Bangla songs, old and new will forever have a prominent place in the country's culture.